This course made me so happy and eager to wake up to see what the next module was about. I've seen many of the movies several times, but it was fun to hear the back stories and also learn about the artists behind the scenes. And I finally watched GiGi - a movie I put off for several years, because I watched it for 15 minutes once and didn't like it. What a mistake that was! In the podcast it was also said that "New York, New York" was directed by Coppola; however it is Scorsese. I volunteer at my local public library every week - shelving and shelf-reading the DVDs. I find quite a few classics in the mix. There are movies, TV shows, foreign films, instruction videos, and documentary films. It is a wonderful resource. I'm with you. I am also retired. It is very hard for me to sit still and watch any movie (not just my favorite - musicals) without getting antsy. 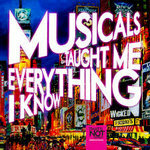 I am planning to watch some documentaries (one of my favorite genres) on musicals. I am also going to brush off all the "That's Entertainment" videos, as well as "That's Dancing". What Did You Give Up To Watch Tons of Musicals? My feelings exactly. It has been a wonderful experience which I will never forget. The online community has been the best! Thank you to everyone! Count me in as another appreciative participant. It was wonderful! Thank you to all! Sonny Corleone, Song and Dance Man? I enjoyed watching him in both Funny Lady and For the Boys. By the way, he was my favorite Corleone brother. I was finally able to get in with my IPhone...however the sound and picture kept on buffering out. I am hoping that the session will be able to access on-demand and not live. What I could manage to hear was interesting. I am very disappointed. I am trying on my IPad as well - on the Shindig app. Just buffering. I was looking so forward to this. I went on YouTube and found this clip. It is very short. They are if you have the DVD option. We have the streaming and DVD plan and I order often. The movie Silk Stockings arrived here a few days ago. I either order from Netflix, or many times my area public library has many different genres of DVDs that are available for loan. I just put the movie in my DVD queue on Netflix. I will be watching it as soon as it arrives. Thank you!! !